Royal LePage offers optimal customer service in order to deliver the best possible results to its clientele. Contrary to the way real estate was (years ago when real estate brokerages represented only the seller), you now have the option of being represented by a buyer’s agent, who’s responsibility is to protect you, your family, and your best interests all while providing you with the essential information needed in order for you to make an informed decision when it comes time to buying a home. A buyer’s representative will locate the best homes that fit your needs. This will work in your favour, not only as a saver of time, but also in such a way that will deter you from those homes that just aren’t right for you. This said, among these suitable homes, research is done by your representative in order to foresee any potential issues that lie with the selected properties so that when it comes time to sign papers, your decision has been made in an informed manner. With a buyer’s agent, you will have someone to accompany you on showings, familiarize you and your family with the selected neighbourhoods and what they have to offer, assist you in securing your financing, and recommend appraisals as well as home inspections, among many additional trustworthy duties. 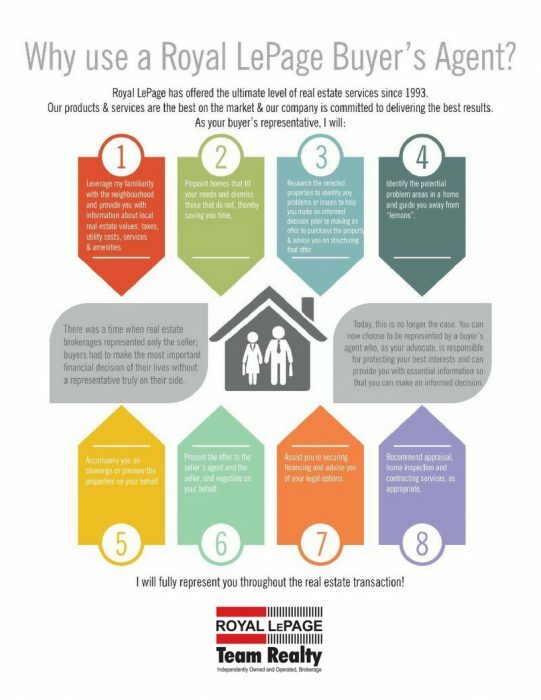 Royal LePage offers some of the best commitment on the market, and our buyer’s representatives will thoroughly represent you throughout the entire home-buying process in order to make your experience with us a memorable one.